Note: Died 1842 per cemetery records. He is thought to be the son of Isaac Hageman Sr. and his second wife Ellen Vorhees. 1791. ISAAC6 HEGAMAN [SIC, should be HAGEMAN] (Sarah5, Petrus4, Jan3, Lucas2, Steven1);2457 born 27 Sep 1776; baptized 27 Oct 1776 at Ref. Ch., Six Mile Run, Somerset Co., NJ; married first Maria Vanderveer 25 Jan 1899; married Ellen Voorhees, daughter of William Voorhees and Alche VanDorn, 8 Feb 1834 at Ref. 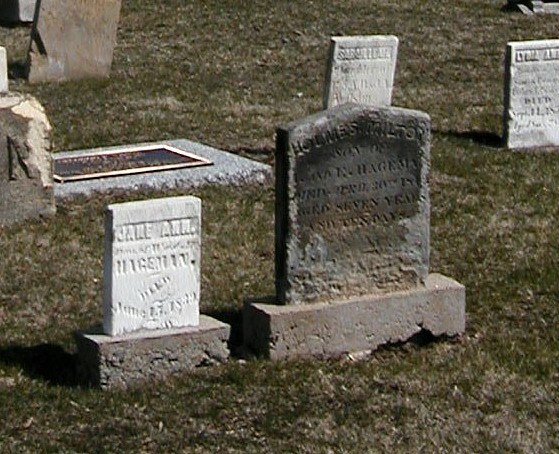 Ch., Harlingen, Somerset Co., NJ; died 15 Nov. 1849 at Fairview, Fulton Co., IL, at age 73. ELLEN VOORHEES.2459 She and her husband were half-cousins once removed. Their common ancestor was Steven Coert Voorhees. She died leaving no living descendants. Her husband Isaac Hegeman 1779-1849 was the father of Isaac Hegeman Jr. 1810-1891 who married Ellen's sister Maria Wyckoff Voorhees in 1831. She was born on 14 Sep 1813. 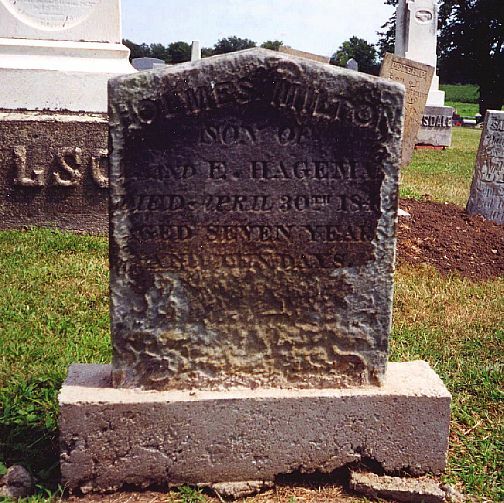 She was baptized on 5 Jun 1814 at Millstone Ref. Ch., Harlingen, Somerset Co., NJ. She married second Samuel Frankish on 3 Aug 1851. she died on 1 May 1886 at Fairview, Fulton Co., IL, at age 72. 4432. i. HOLMES MILTON7HEGAMAN [SIC, should be HAGEMAN]; born circa 1838; died 30 Apr 1842 at Fairview, Fulton Co., IL; buried at Fairview, Fulton Co., IL.